Jinks has stated that once the rubber dam is applied on patients, they get the impression that the treatment is taking place outside their mouth; hence, they can tolerate treatments for a longer period. Time is saved when the rubber dam isolation method is used by pediatric dentists, mainly because there is better soft-tissue management and changing of cotton rolls can be omitted. 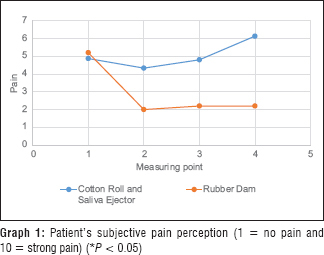 The aim of this study was to evaluate subjective and objective stress parameters in patients undergoing dental treatment using rubber dam as compared to isolation with cotton rolls and saliva ejector and to evaluate the stress level of the operator. Null hypothesis – The null hypothesis was that there was no difference in stress parameters between the test and the control group. This study was conducted in the Department of Paedodontics and Preventive Dentistry. Ethical clearance was obtained from the Institutional Review Board of Terna Dental College, Navi Mumbai (IRB-EC/162/2017). All procedures carried out in this study involving human participants were in accordance with the 1964 Helsinki declaration and its later amendments or comparable ethical standards as well as the International conference on harmonization guideline for good clinical practice. Patients between 7 and 9 years of age group, who required pit and fissure sealing procedure according to International Caries Detection and Assessment System II Criteria [Table 1] were included in this study. Written consent was obtained from the parents of the children who were selected for the study. A total of 30 patients with bilateral fully erupted lower first permanent molars were selected for the study. For each patient, one tooth was selected for test group using rubber dam. The corresponding tooth from the opposite quadrant was selected for the control group using saliva ejector and cotton roll. On the first visit, rubber dam application as an isolation method was used for pit and fissure sealing procedure. On the next visit, cotton rolls and saliva ejector was used as an isolation method for pit and fissure sealing procedure. An interval of 1 week was kept between the two visits. The patient's parameters such as blood pressure, breath rate, and pulse rate which denotes stress levels were recorded at four measuring points [Table 2]. Blood pressure and pulse rate were measured by automatic digital blood pressure monitor (arm automatic blood pressure meter, India; Model no-RS-BP-1004). The breath rate was measured manually by a dental assistant. The patient's subjective pain perception during the dental procedure at four measuring points was recorded using visual analog scale by a dental assistant (1–10). For the operator, the pulse rate as a stress parameter was recorded at four measuring points by a dental assistant [Table 2]. Blood pressure, breath rate, and pulse rate of the patient as well as pulse rate of the operator were recorded at different treatment phases such as baseline, after sitting on the treatment chair, after curing of the sealant just before removing rubber dam/cotton roll and after the treatment was completed [Table 2]. The teeth were cleaned with a prophylactic paste (Prophy paste, United Kingdom) for 30 s. It was then rinsed with water and air dried. Afterward, rubber dam application was done on the tooth to be treated using a suitable rubber dam clamp (GDC Marketing Co., India). The tooth was etched using 37% phosphoric acid gel (3M Scotchbond™ Universal Etchant, United States) for 15 s and rinsed with water for 20 s. The tooth was air dried for 20 s. The fissure sealant (SDI Limited, Australia) was applied using manufacturer's instructions. Ball-shaped plugger was used to remove blebs from peripheral to central and excess material from side of the fissures was removed with cotton pellets. The sealant was then cured with light (Bluephase, Confident Dental Equipments Ltd, India) for 20 s.
In the control group, the cotton rolls were positioned on the buccal and lingual region of the tooth to be treated. A saliva ejector was placed on the lingual side of the tooth, and buccal cheek was retracted with the help of mouth mirror. The pit and fissure sealant was then applied on the tooth isolated as mentioned above. After the treatment procedure, the occlusion was checked. A fluoride varnish (Fluor Protector, Ivoclar Vivadent, Schaan, Liechtenstein) was applied after the treatment was done. Mean values of subjective perception of pain during treatment were found higher for the control group at measuring points (points 2 and 3) [Graph 1]. The blood pressure and breath rate of the patients were slightly higher in the control group as compared to the test group; however, it was not statistically significant. The pulse rate of the patients in the control group was slightly higher than the test group at measuring points (points 1, 2 and 4); however, it was statistically significant at measuring points (points 1 and 4) (P < 0.05) [Table 3] and [Graph 2], [Graph 3]. 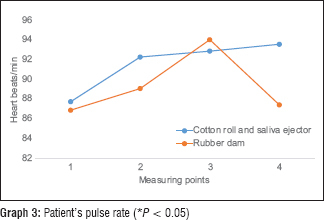 The pulse rate of the operator when using rubber dam was lower at all measuring points, but at measuring points (point 2 and 3), it was statistically significant [Table 4] and [Graph 4]. The self-perceived mental and also significantly lower when using rubber dam for isolation. Statistical analysis was done using the SPSS version 21 software (SPSS Inc., Chicago IL, USA). For the comparison of the mean values between groups at different measuring points, Paired t-test with ANOVA test followed by post hoc test was used. The level for statistical significance was set at P < 0.05. A total of 30 patients aged between 7 and 9 years participated in the study. Sealants were applied on 60 teeth in bilateral fully erupted lower first permanent molars. On 30 teeth, rubber dam application was done whereas on the other 30 teeth, cotton roll and saliva ejector were used for isolation during pit and fissure sealant procedure. The fissure sealing procedure was chosen for this trial so as to induce balanced and relatively low-stress level in patients. Other adhesive restorative procedures could have been more difficult to standardize and would have caused a wider variety of stress levels; hence, they were not included in the current study. The subjective view of the children was supported by the objective bio signals collected during the treatment procedure. Blood pressure, breath rate, and pulse rate have been reported to be bio signals related to stress; hence, they were measured. Brandstetter found lower pulse rate of the operator during the treatment procedure with rubber dam. This was interpreted as signs of a higher degree of relaxation. Similarly, our study also showed a significant reduction in pulse rate of the operator during the treatment procedure using rubber dam. Significant reduction in pulse rate of the patient was also observed during treatment procedure with rubber dam indicating lower stress level in the test group. A possible explanation for this can be that once rubber dam is in place, it separates the operative field in a way that the patient perceives the treatment procedure being performed outside of his/her body, whereas the manipulation of cotton rolls and saliva ejector takes place inside the patient's mouth. Monitoring the operator's pulse rate during treatment procedure was necessary as operator's stress levels might influence the stress levels of patients. This is because stress levels of the operator might get transferred to the patient during the treatment. Conclusions from this study have to be drawn carefully because it was not possible to blind the operator with regard to the treatment procedure (with or without rubber dam) and his personal preference for rubber dam application was certainly a bias for the outcome of this study. 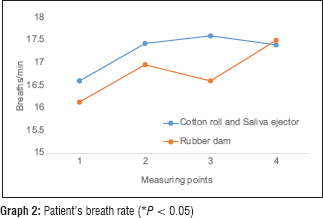 This study concludes that isolation with rubber dam was less stressful for patients than isolation with cotton rolls and saliva ejector. 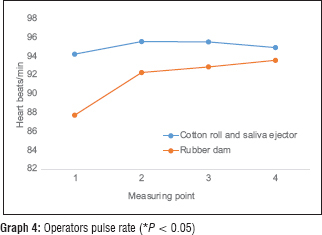 This study also concludes that using rubber dam as an isolation method was less stressful for the operator than using cotton rolls and saliva ejector. We would like to thank Dr. Nikhil Bhanushali from Department of Public Health Dentistry for his assistance in statistical analysis in this study. Rule RW. Rubber dam – Its use and adjustment. Pac Dent Gas 1931;39:541-56. Jinks GM. Rubber dam technique in pedodontics. Dent Clin North Am 1966;327-40. Kilpatrick N, Page J, Welbury RR. Operative treatment of dental caries. In: Pediatric Dentistry. 2nd ed. Oxford: Oxford University Press; 2001. p. 135-56. Christensen GJ. Using rubber dams to boost quality, quantity of restorative services. J Am Dent Assoc 1994;125:81-2. Langerweger C, van Waes H. Drainage and isolation of the work field in pediatric dentistry (II). A market overview and suitability study: isolation of the work field without dams 1998;108:1097-104. Jablonski-Momeni A, Stachniss V, Ricketts DN, Heinzel-Gutenbrunner M, Pieper K. Reproducibility and accuracy of the ICDAS-II for detection of occlusal caries in vitro. Caries Res 2008;42:79-87. 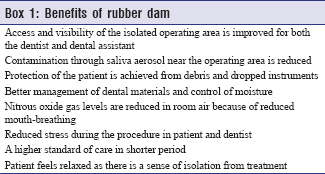 Ammann P, Kolb A, Lussi A, Seemann R. Influence of rubber dam on objective and subjective parameters of stress during dental treatment of children and adolescents - a randomized controlled clinical pilot study. Int J Paediatr Dent 2013;23:110-5. Bolaños-Carmona V, González-López S, Briones-Luján T, De Haro-Muñoz C, de la Macorra JC. Effects of etching time of primary dentin on interface morphology and microtensile bond strength. Dent Mater 2006;22:1121-9. Splieth C, Forster M, Meyer G. Additional caries protection by sealing first molars compared to fluoride varnish applications in children with low caries prevalence: 2-year results. Eur J Paediatr Dent 2001;2:133-8. Brandstetter M. Rubber dam application from the perspective of the practitioner with objective stress parameters.1999;22:323-329. Winkler R. Rubber dam in theory and practice. Berlin: Quintessence Publishing;1991;3:15-17.